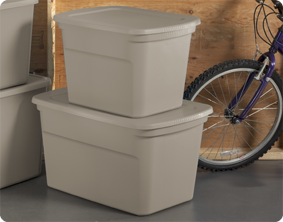 Get organized with the 30 Gallon Tote. This popular size tote is ideal for a variety of basic household needs, such as sorting and storing away bedding, sporting gear, seasonal decorations and other large, bulky items! The lid snaps tightly to the base, keeping contents contained and concealed. The in -molded handles provide a grip for lifting and carrying, making transporting the tote easier, whether moving into a dorm or storing away belongings in the attic or basement. The indexed surface of the lid allows multiple totes to stack neatly on top of each other for efficient use of vertical storage space. The classic styling offers a refreshing, clean, and coordinated look. The overall dimensions of this item are 30 1/2" L x 20 1/4" W x 17 1/8"H.
Overall Assembled Size: 30 1/2" x 20 1/4" x 17 1/8"
30 Gallon Tote is rated 4.8 out of 5 by 30. Rated 3 out of 5 by ringoquads from Only Problem Is... I really like this bin minus one problem I can't overlook. I have 3 bins stacked on top of each other. The weight from the top bin has caused the other 2 bin lids below to bow out in the middle. I'm super picky and they now look terrible. Next time i with definitely go with a stronger higher grade plastic. Rated 5 out of 5 by Ann34 from This product is tough. This tote closes tightly and securely.It fits into my closet great,I like how I can put things on top of it and store things in it.I do not have any complaints. It feels like it will last awhile,it was an affordable price.It is super easy to clean. Rated 5 out of 5 by PoppieBill from SOME CALL IT HOME Winter Home for TNR'S. Lined with foam insulation and reflective bubble insulation and a 9" dia.hole in the side for entry, this kitty condo has been a winter home for two years for a few stray residents. A couple of containers are grouped filled with straw and covered with a waterproof heavy compost cover in a secure and sheltered area. I've also used these containers for worm composting and engine covers for garden machines and tools.For prolonged use outdoors as they weather a coat of plastic paint spray does the trick. Rated 5 out of 5 by Joanlukach from Leaf pickup I bought this container to pick up leave in the yard. It makes carrying them to the drop off site much easier and neater. Rated 5 out of 5 by Great organizer! from Great for the classroom I used this large tote to store student backpacks and it worked very well. They hold a lot and take up minimal space. Rated 5 out of 5 by ej from The PERFECT solution I have a large amount of Christmas decorations, some of which were not inexpensive. I use these totes (as well as the 18 and 10 gallon) to store my decorations. My inventory shows 58 totes in all. Everything is always in perfect condition when I unpack it and the stackability allows me to store all these in a relatively small space. Oh yes, I have some for every season. Rated 5 out of 5 by Chatham Happy from Blanket Storage The 30 gallon tote holds extra blankets and two huge, puffy comforters. My linen closet was a mess, blankets falling off the shelves. The tote was the perfect solution for me. Rated 4 out of 5 by sergio velasquez from this product has many uses. this item has been great for puting anything you want to store,holiday items to toys,and more.